Different specification of components results in varying power supply wattage requirement. It is important to install power supply unit with required wattage to make computer work properly. Power supply requirement is calculated taking into consideration specifications of different components and associated power requirements. NewEgg has online power supply calculator which tells you probable wattage requirement based on specifications of components on your computer. You need to select specs for: CPU, motherboard, VGA card, memory, ODD, HDD. 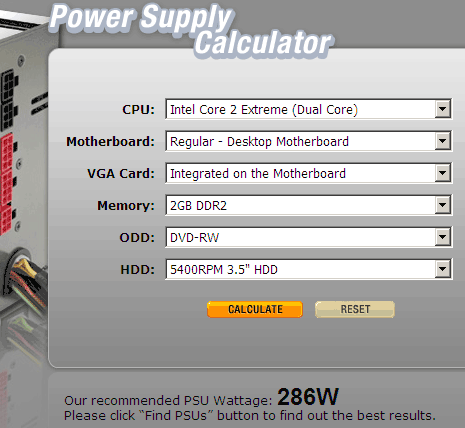 Click the calculate button to see power supply requirement in watts. Please note, it only provide general idea or estimate. Checkout Power Supply Calculator for quick wattage calculation online.